“When you rolled back that guidance, did you know that the stress of harassment and discrimination can lead to lower attendance and grades as well as depression and anxiety for transgender students?” Bonamici asked. DeVos started to explain that the Office for Civil Rights was “committed” to protecting all students and making sure they were given equal access to education before Bonamici quickly cut her off. “I’m sorry, but I would really like an answer. Students and families need to know this,” Bonamici said. She then repeated her previous question of whether DeVos knew of the consquences for transgender students of rolling back the Obama administration’s guidance. “I do know that,” DeVos answered. 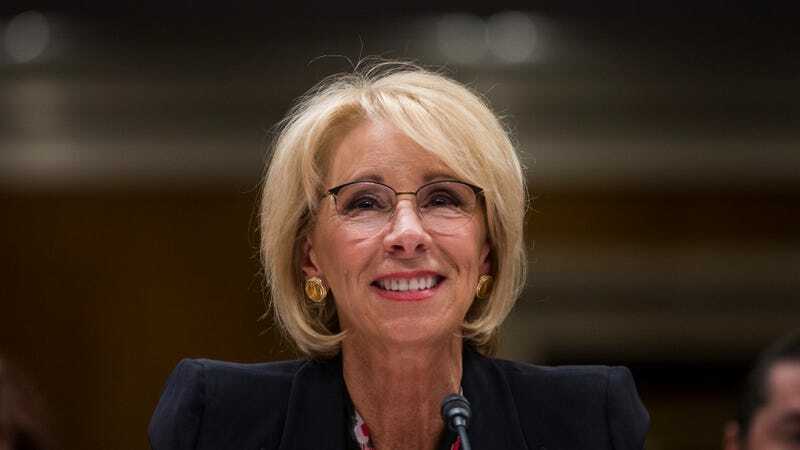 She added that she is committed “to ensuring that all students have access to their education free from discrimination,” despite presiding over an agency that has scaled back its investigations into potential civil rights violations. Shortly after Trump took office in 2017, the Education Department rescinded the Obama administration’s bathroom guidelines. It was widely reported at the time that DeVos was reluctant to rollback protections for trans students, but was pressured by then-Attorney General Jeff Sessions and Donald Trump to do so. But in the months and years since, DeVos and the Department of Education have gone even further, declining to review complaints from trans students who have been barred from using the bathroom matching their gender identity, a position that flies in the face of multiple federal court rulings. At Wednesday’s hearing, Bonamici also pressed DeVos on whether she was aware of the “alarming levels” of suicide attempts by trans young people. “I’m aware of that data,” DeVos replied. But oops, I guess she doesn’t really care.